For each of the 50 global risks, respondents were asked to assess, on a scale from 1 to 5, the likelihood of the risks occurring over the next 10 years and the impact if the risk were to occur. 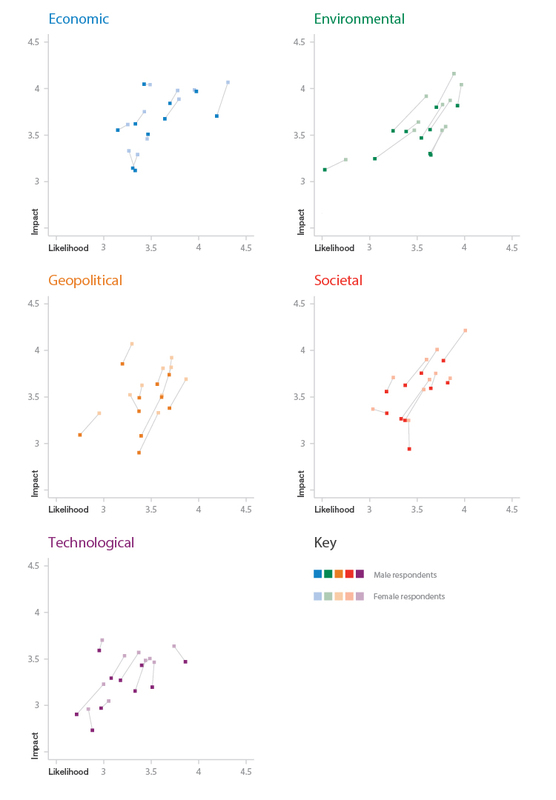 Figure 29 indicates the average values of these two measures for each of the 50 global risks in their respective categories (see also Figure 2 the Global Risks Landscape scatterplot, showing them in one combined graph). Almost all dots on the scatterplots are above and to the right of the midpoints (at 3 or more) of the 1 to 5 axes, suggesting that the majority of the 50 global risks were rated, on average, as having high likelihood and impact. Nonetheless, there is some interesting variation in the dots’ placement on the landscape. 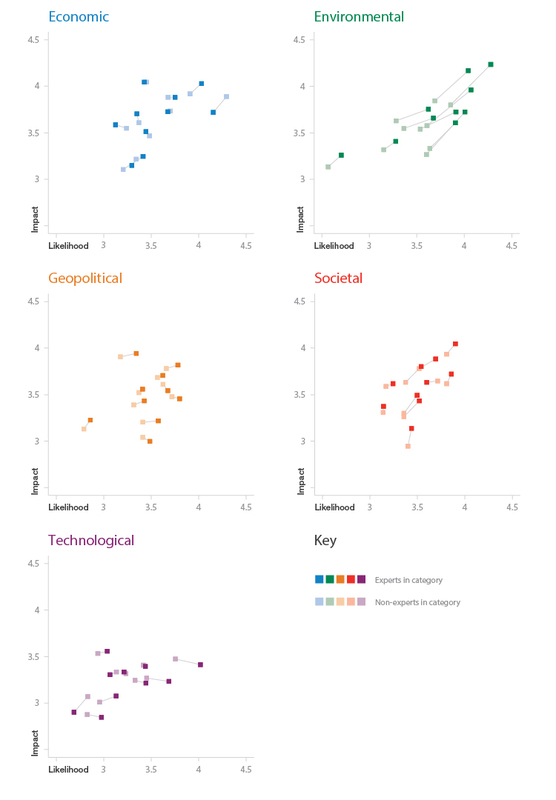 Some economic risks, such as major systemic financial failure, chronic fiscal imbalances and severe income disparity are far out towards the top-right hand corner, with impact and likelihood scores around 4 (on a scale from 1 to 5, which is high for an average ranking). Some of the technological risks are closer to the middle of the axes, with impact and likelihood scores 3 or less. As was observed in previous editions of the Global Risks report, there appears to be a strong relationship between the likelihood and impact. The dots seem to line up loosely around the 45-degree line and there are no dots in the bottom-right or top-left corners of the plot. Survey respondents seem to be associating high-likelihood events with high impacts. This finding holds up even when looking at individual responses for each of the risks and not only average numbers. 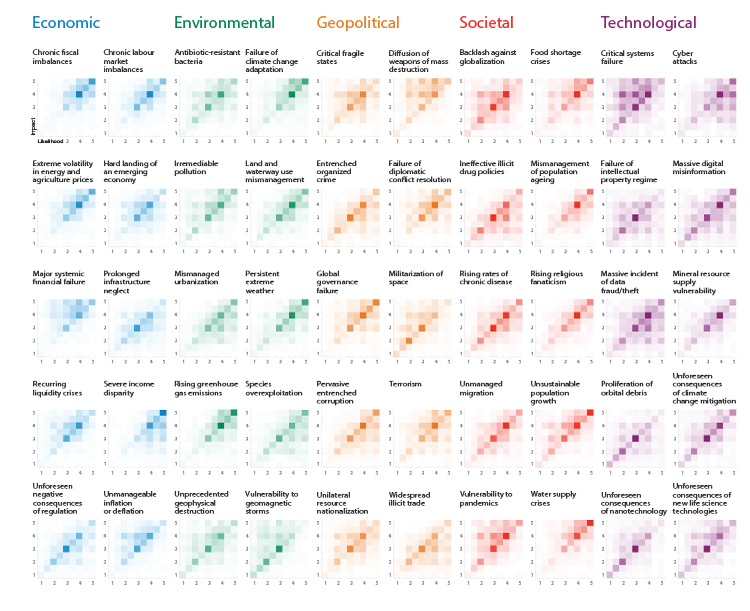 The colourful tiles in Figure 30 show how the responses are distributed across the scatterplot for each of the 50 risks. While there were some responses that were off the 45-degree line, the combinations of impact and likelihood that got the most votes from survey respondents – as indicated by the dark-coloured tiles – seem to be near that diagonal in almost all of the 50 diagrams. NB: These diagrams show how individual survey responses are distributed across the different possible combinations of likelihood and impact scores, as measured, respectively, on the horizontal and vertical axes of the graphs. The darker the colour of the tile, the more often that particular combination was chosen by the experts who took the survey. While there is some movement of individual dots, compared with last year’s scatterplot, the general distribution of the risks on the risk landscape is, perhaps unsurprisingly, similar (see Figure 1). What is surprising, though, is that respondents this year see risks as more likely and as having a higher impact than respondents to the previous year’s survey. The average likelihood score is 0.15 units higher (on a scale from 1 to 5) and the average impact score is 0.13 units higher. Part of the increase in impact (about a quarter of the difference) can be explained by the fact that the average age of the survey sample has decreased and, as shown below, younger people tend to give higher answers when it comes to assessing a risk’s impact. Nonetheless, even controlling for age and other different characteristics of the sample, the perceived likelihood and impact of many of the risks have increased. the geopolitical risk: unilateral resource nationalization. Only very few risks had their average scores decrease from last year. On the likelihood scale, these include recurring liquidity crises, vulnerability to geomagnetic storms and proliferation of orbital debris. The only risk where there was a statistically significant decrease in terms of its impact was food shortage crises. Survey respondents were asked to provide some information about their background: their age, their gender, where they live, for what kind of organization they work, and their subject-area expertise. Using this demographic data the risks landscape was cut up in different ways to see how different groups with specific characteristics perceive global risks. Figure 31, for instance, shows how respondents based in North America tend to rate many risks as having a higher likelihood than respondents in other regions. 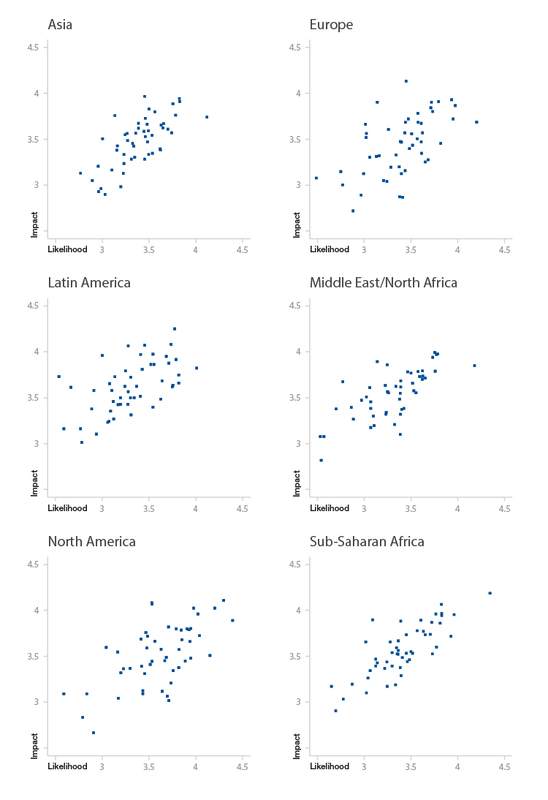 The dots are markedly further to the right in the scatterplot, and for a large number of risks the differences with other regions are statistically significant. These include chronic fiscal imbalances, prolonged infrastructure neglect, rising greenhouse gas emissions, diffusion of weapons of mass destruction and cyber attacks (see Appendix 2 for detailed results). 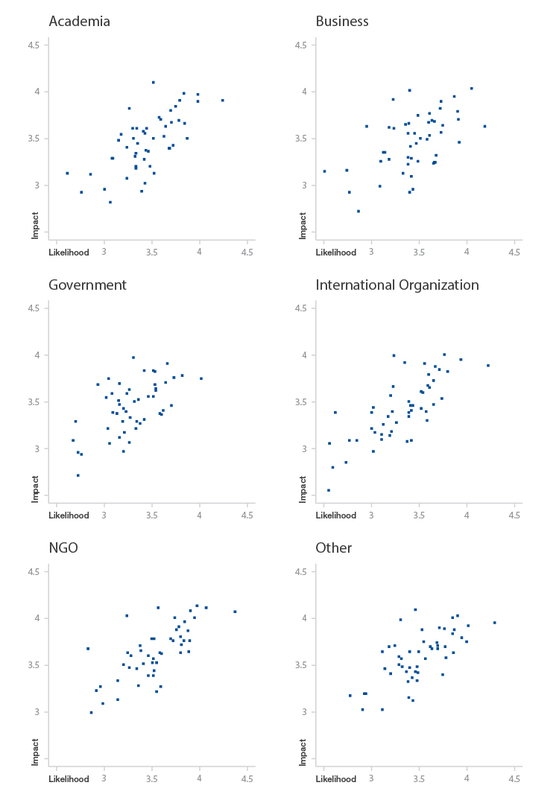 The scatterplot for Latin America demonstrates that respondents based in that region tend to assign a higher impact to risks. For instance, they see the impact of ineffective illicit drug policies as significantly higher than survey takers from other regions. It is also interesting that average responses from respondents based in Asia are clustered more densely together. For most individual risks, this difference was statistically significant at the 5% level. There is only one risk, backlash against globalization, which men rated as more likely than women. Figure 34 shows that respondents aged 40 or younger tend to rate most risks as higher in impact than those over 40. There is no risk where the older group’s impact scores are significantly higher. For many risks, the younger experts also chose higher likelihood scores. But there are a few exceptions where respondents over 40 rated risks as more likely to occur in the next 10 years than the respondents under 40: prolonged infrastructure neglect, failure of climate change adaptation, rising greenhouse gas emissions and diffusion of weapons of mass destruction. 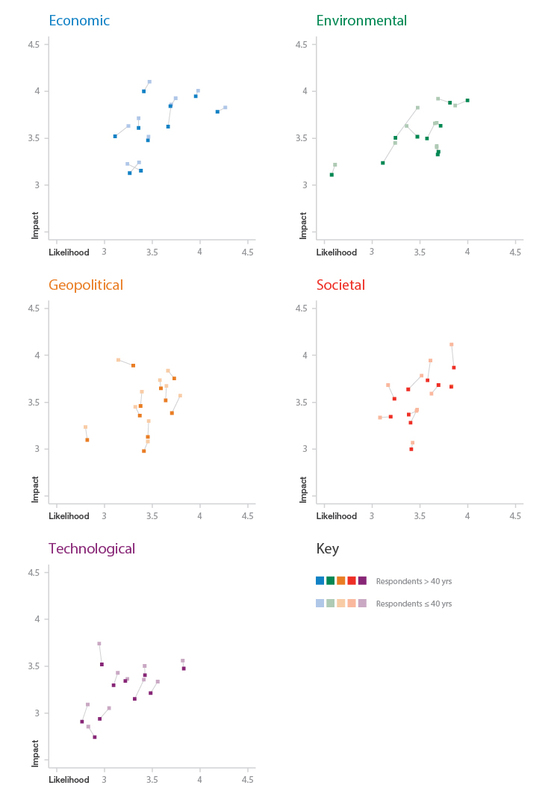 It is interesting that high-level decision-makers tend to be drawn mostly from the group – older males – that the breakdowns by age and gender indicate is least inclined to worry about global risks. Finally, it is possible to look at how subject expertise affects risk perceptions. Respondents were asked to identify in which of the five categories (which group the 50 risks) they consider themselves experts. While there is no generalization that can be made about all risks, there are some interesting cases where experts are more worried about risks. 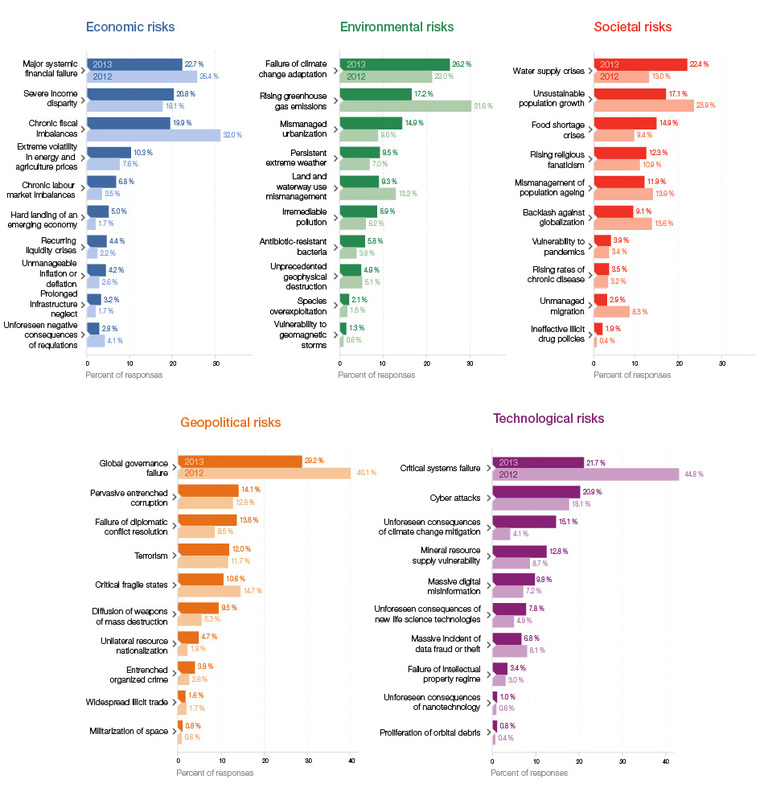 The differences between environmental experts and their peers from other fields are striking – they assign higher impact and likelihood scores to all 10 risks in the environmental category, with most of these differences being statistically significant at the 5% level (see Appendix 2). 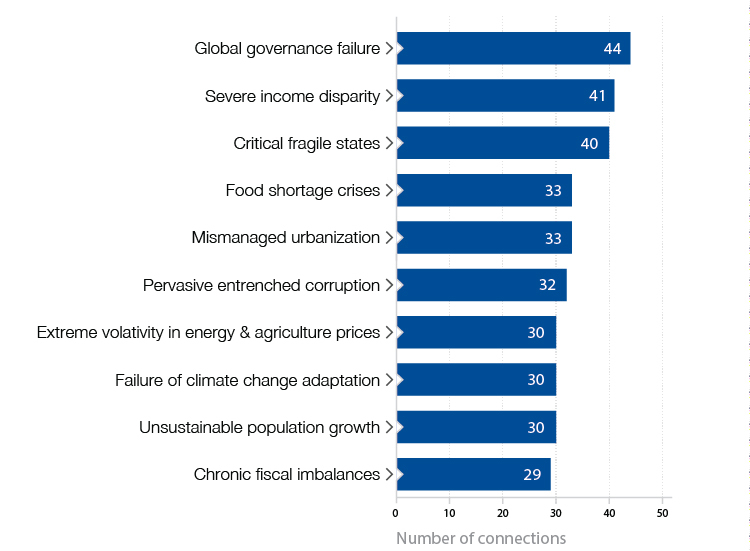 Also there are a number of societal risks where specialists are more alarmed than other respondents, such as rising rates of chronic diseases, unsustainable population growth or unmanaged migration. In the economic category, this pattern holds only for chronic fiscal imbalances. For most other risks in this category, as well as in the geopolitical and in the technological domains, there are few statistically significant differences. On the other side of the equation, experts in economic issues worry less about the impact and likelihood of severe income disparity than non-experts. Similarly, technological experts worry less than non-experts about the likelihood and impact of unforeseen consequences of nanotechnology. Finally, the survey asked respondents to choose pairs of risks which they think are strongly interconnected.xlix They were asked to pick a minimum of three and maximum of ten such connections. Putting together all chosen paired connections from all respondents leads to the network diagram presented in Figure 37 – the Risk Interconnection Map. The diagram is constructed so that more connected risks are closer to the centre, while weakly connected risks are further out. The strength of the line depends on how many people had selected that particular combination. Five hundred and twenty-nine different connections were identified by survey respondents out of the theoretical maximum of 1,225 combinations possible. The top selected combinations are shown in Figure 38. 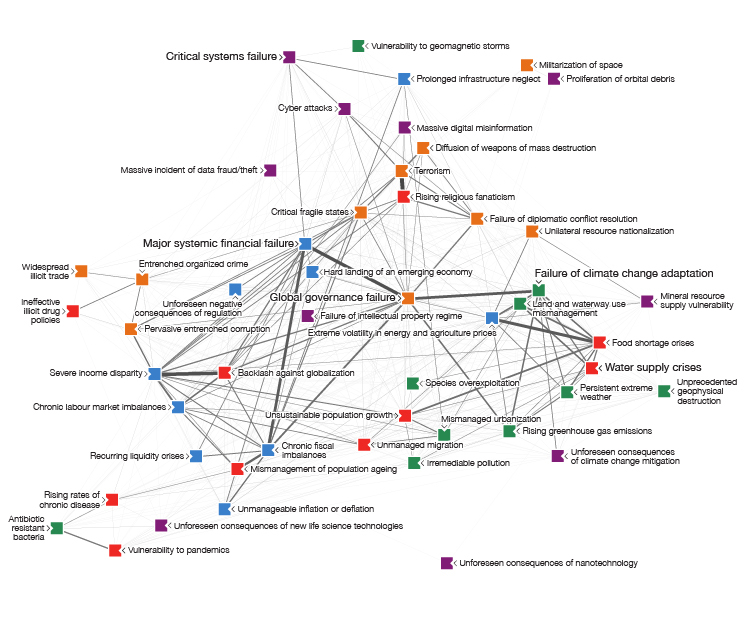 It is also interesting to see which are the most connected risks (see Figure 39) and where the five centres of gravity are located in the network (see Figure 40). xlvii See Appendix 1 for a more detailed description of the sample. xlviii Controlling for other characteristics of the sample, the respective differences would be 0.087 and 0.18 units. 1 Finucane, M. L., Slovic, P., Mertz, C. K., & Flynn, J. Gender, Race, and Perceived Risk: the 'White Male’ Effect. In Health, Risk and Society, 2000, 2:159-172; Gustafson, P.E. Gender Differences in Risk Perception: Theoretical and Methodological Perspectives. In Risk Analysis, 1998, 18:805-811; and Harris, C. R., Jenkins, M., & Glaser, D. Gender Differences in Risk Assessment: Why Do Women Take Fewer Risks Than Men. In Judgment and Decision Making, 2006, 1:48-63. 2 Deery, H.A. Hazard and Risk Perception among Young Novice Drivers. In Journal of Safety Research, 1999, 30:225-236; and Jonah, B.A., & Dawson, N.E. Youth and risk: Age Differences in Risky Driving, Risk Perception, and Risk Utility. In Alcohol, Drugs & Driving, 1987, 3:13-29. 3 Savage, I. Demographic Influences on Risk Perceptions. In Risk Analysis, 1993, 13:413-420.
xlix When two risks are connected, it simply means that respondents believe that there is some sort of correlation between the two. Causal direction cannot be deduced.